In the event of a disaster, you can possibly face a three day (72 hour) wait time between the disaster and aid reaching your area. Being prepared to face that three day wait can be the difference between life and death. 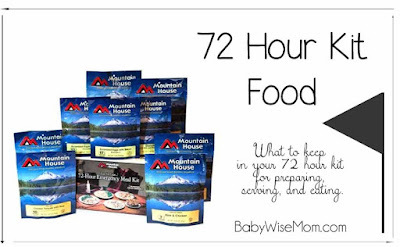 Each member of your family should have a 72 hour kit. This post contains affiliate links. This does not increase your cost. 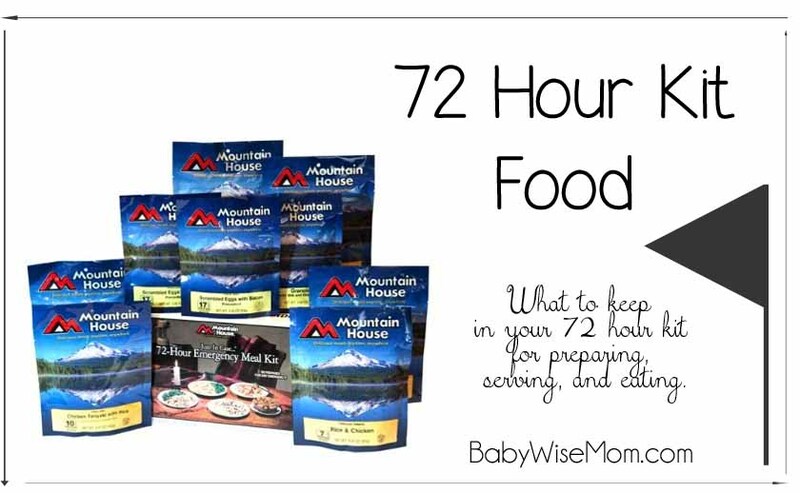 One of the categories for a 72 hour kit is food (for a full list, see my post on 72 Hour Kit Free Printables). You can purchase a pre-made kit all ready for you (which honestly isn’t a bad idea). We have been working on creating our own kits for years. The idea was that we could save money over buying a pre-made kit, but I am not sure if that is true or not in the long run. The pre-made kits are not as complete as I would like a kit to be, but they do have the basic vitals. I recently stocked up our kits with food. If you are like me, you will have a hard time spending money on things you hope to never use. It is hard! It is also wise and is something you won’t regret in case of an emergency. Here is what we went with. This is a spendy item at about $55.00 for a 3 day supply of food. I decided to buy two kits to share around our family. However, after purchasing them and shopping around, I bought a third kit. These kits last at least 12 years, where food I was looking at in the store rarely made it a year. I wanted the food to be light-weight and easy to prepare. With these kits, you just add water to the bag. Very simple. I decided this food was a good way to go so we don’t have to rotate often, it can be light, and the taste can be manageable. I realized by the time I need to rotate this food out, at least Brayden and Kaitlyn will be moved out and on their own (wow!). So while it was spendy now, it will be less expensive the next time. I figure when it comes time to rotate, we will use these on a camping trip. I don’t mind having food in our 72 kits that needs to be rotated often if it is a food we will eat. We will eat instant oatmeal, so I purchased enough instant oatmeal for each kit for breakfast for 3 days. That way when it is time to rotate the food, we can use the oatmeal up without grossing ourselves out. The tricky thing to these pouches and the oatmeal is that you need hot water. I purchased a few folding stoves–one for my husband’s kit, one for mine, and one for Brayden’s since he is old enough to be able to operate it easily. They are light and fold flat, so they don’t take up too much space in your 72 hour kit. You need a heat source for your folding stove. You can buy Sterno cans; I went with this less expensive brand. It rates well and I have used items from that company before with great satisfaction. You can buy fancy mess kits. Since these are just for our 72 kits, I bought a basic mess kit for each 72 hour kit. A frying pan, a pot, a plate, and a cup. It will work for what we need and it is less than $10.00 each. We can use it for dishes and/or for heating water. 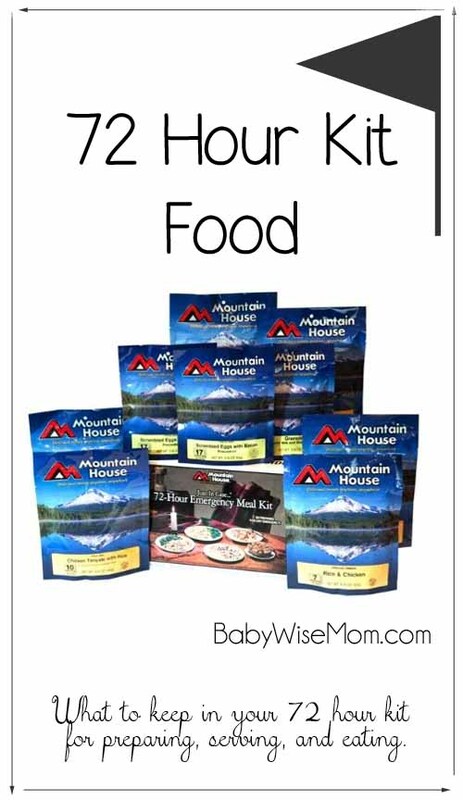 No one wants to just eat a small pouch of freeze dried food three times a day. Morale is worth something. I got enough of these fruit crisps for each person to have a few each day. Again, this is a food we won’t feel bad eating if we need to eat it to rotate the food in the kits and keep it fresh. You could do any sort of dried fruit, including rasins. I also put a few granola bars per day in each kit. Again, morale, and again, a food we can eat when needed to rotate before it expires. Hard candy is a good one to have in the kits to help give you some variety. You can purchase hard candy, or you can do like we did and set some aside from parade candy or Halloween candy (or pick any other candy day that comes along…). Another option for food is an MRE. An MRE provides a lot more calories per meal than the food packs I bought (listed above). Shelf life is 5-10 years on these, and they definitely are not any cheaper–they are actually more than twice as much money. But you could probably eat one as your lunch AND dinner since the calorie content is so high. These do not need water added, so you can get these and skip the stove and fuel cans. It is worth considering.